"I always knew I would turn a corner and run into this day, but I ain't prepared for it nohow." B i>oval box (1 1/4 inches wide, 5/8 inch tall with bezel). Both have a fully bezeled piece of Fossil Ivory on top. 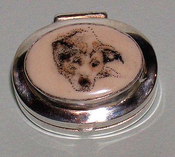 Fossil Ivory scrimshawed at no additional cost with one of our traditional designs - Choose your design from either a nautical theme or flowers at no extra cost, or send us your own favorite picture (pet/boat/house - see insert above) to be hand-etched at a small extra charge. Add three initials stamped on bottom as an extra option. Shown with Light Mammoth Ivory. The traditional fourteenth wedding anniversary gift is Ivory! We're here to help! We stand ready to scrimshaw anything you would like on any of our pieces - animals, ship's and family portraits, landscapes, nautical scenes, hunting scenes, etc. We do many special order commission pieces from blazer buttons, knitting needles (knitters take note! ), fountain pens, corkscrews, pistol grips, ball point pens and mechanical pencils, desk accessories, Fossil Ivory ship models, ship half hulls, Nantucket and Lightship Baskets, to custom whole Sperm Whale Teeth or whole Walrus Tusks. We also handcraft fossil ivory sailing/nautical trophies to order. We can personalize any piece with a scrimshawed name and initials at no extra charge. (Email us with any queries. Just email us at aistudios@comcast.net and let us know your special order needs! The available colors of our high quality Fossilized Ivories are shown below. Please allow for some color variation in these natural materials. Our Rare Blue Fossil Walrus Ivory may have streaks of white, pink, brown or gray. Our natural wonderful Ivories have been reclaimed from the ground after sharing the earth for up to 30 millennia! Even after all this time, Fossil Ivory remains warm and sensuous organic ivory; it is not petrified. It has developed many of its beautiful colors by taking up minerals from the ground. In time, the Fossil Ivories you wear or use will take on very personal hues from your contact. They will become a part of you. Please Note: Since these colors are rare, some are not always available for every item. Please see each item for available color choices. These are our scrimshaw Design Etchings. In addition to these designs, as an added option, you may send us a picture of your choice for a commission price quote. Looking for thoughtful and interesting gifts? Know someone who absolutely loves his boat? Let us hand etch it's portrait, along with name and hull number - and the name of the captain - on one of our knives, pendants, money clips, or any of our other pieces! Ancient Ivories Studios handcrafted items make sensational and warmly personalized gifts that will be treasured and enjoyed. Please bookmark our site. We add new designs and items periodically. We offer the best prices on the web and outstanding value - check us out! Most of our pieces are unique treasures created especially for the prospective wearer. 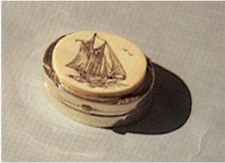 Want to help us design your scrimshaw piece? Whether it's a fossil ivory Amulet or Talisman, Scrimshaw jewelry, personalized scrimshaw knives, Fossil Ivory Wedding or Commitment Band, Pendants, Brooches, scrimshaw sailor's Knife, Sterling Silver and scrimshaw Box, Scrimshaw Sperm Whale's Tooth, or Sterling Silver and Ivory scrimshaw Spoons and Tableware, just email us and we will work with you for a very personal piece you'll love to use or wear! Please note: We reserve the right to limit quantities.